On the cover The article by Eggli and Wyss on p.12 in this issue of the Journal celebrates the formation, development and recent exploits of the Zurich Succulent Plant Collection. 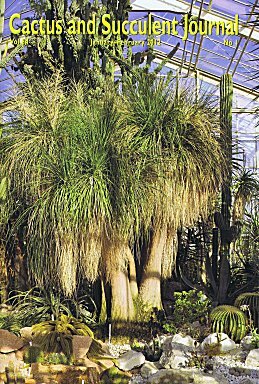 The picture on the cover, of the Grosspflanzenhaus (literally, big plant house), taken by Mr. Michael Lio of Winterthur CH, features Beaucarnea recurvata, together with large specimens of Echinocactus grusonii. A monstrous Cereus jamacaru behind the Beaucarnea is one of several arborescent cacti nearby.